My eighth submission to Curt's Analogue Hobbies Painting Challenge was connected in a way to the fantasy engineers in my last submission. I was rooting around my hobby pile to find them, and came across as exciting discovery of a long-lost "I'll get to this next week project" which has stretched into years and years - Warmaster! Yes, Warmaster, GW's ridiculously fantastic set of macro-level fantasy combat rules. 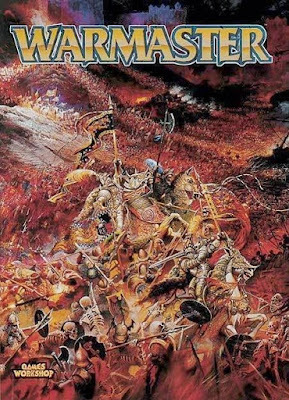 Remember Warmaster? The rules alone were fantastic, serving as the inspiration/basis for many subsequent sets of rules to follow. But it was more than great rules. I also recall the figures - 10 to 12mm collections - that GW released to support these rules were also just tremendous. They had lots of character and variety. Warmaster was a lot of fun and there were many games played among our group back in its time. When Warmaster first came out, I collected and painted a small Empire force. In 2010, I resolved to re-paint it up to a higher standard, and re-base some of the models. This effort lasted through some Knights and some characters and artillery pieces, but not much more - you can find the last blip in this effort in the dusty archives of this blog, back in February of 2010 - seven years ago! Needless to say, other things distracted me, and the Warmaster efforts faded to the background, and these figures when back into storage. Having encountered this little stash of models once again two weeks ago, I figured the Analogue Hobbies Painting Challenge would be a fine time to take another crack at this. So I dove in, and have been sawing away with the brushes on figures that haven't seen sunlight, much less paint, since 2010. I painted a unit of halberdiers and a unit crossbowmen, a did a touch up on an old unit of Knights. I have also spent some time re-basing models I had already touched up, so I can have a sense of coherency among figures which have a seven-to-ten-year interval between painting! Empire hero on a griffon - he'll finally have a force to command after almost 10 years! Various heroes and officers, ready to lead the Empire army to battle! This submission included 60 foot models and 12 mounted models in 10mm. However, the Knights were a touch-up job, not a real paint job and didn't count. This submission counted for 60 points in the end. Another five or six regiments and this will be a fine 2,000 point Empire force, fit for a good-sized game of Warmaster with the group at some point. I think Dallas has Dwarves, and I have unpainted Orcs and Chaos figures...hopefully we can get a game in this year. Very nice looking army. I did like the look of all the Warmaster stuff when it first came out. It was never something that I picked up though. Sensational, just don't know how you manage to cram, so much detail into something so small. Painting Challenge Theme Entry - "East"
Painting Challenge Theme Entry - "Armour"